Trunks: Erect; bark grayish brown or brown, exfoliating in short flakes; wood white, soft. Twigs: Brown, flexible, minutely pubescent with short curved hairs; leaf scars crescent-shaped; buds grayish brown, ovoid to ellipsoid, apex obtuse, scales pubescent. Leaves: Deciduous, opposite, simple; petiole .08 to .2 inch, pubescent; blade elliptic to ovate or nearly round, .6 to 2.5 inches long, .4 to 1.5 inch wide, base wedge-shaped to rounded, margins entire, sometimes irregularly lobed on early leaves, apex acute to obtuse or rounded, minutely apiculate, abaxial surface light green, slightly glaucous, pubescent, adaxial surface green to dark green, not glaucous, glabrous or sparsely pubescent. Flowers: Spikes, (3-)8-20-flowered, in leaf axils of new growth; peduncles .04 to .12 inch. Flowers bisexual, radially symmetric; hypanthium ovoid; sepals 5, connate, lobes .02 to .04 inch; petals 5, connate, corolla pink to greenish pink, campanulate, .12 to .16 inch, villous internally, lobes ca. .05 inch; stamens 5, not exserted; pistil 1; style 1, pilose; stigma head-shaped. Fruit: August to October; drupes, red to pink, nearly globose to ellipsoid, .2 to .28 by .14 to .22 inch diam., smooth, glabrous or sparsely appressed-pubescent distally; stones 2, white, ellipsoid, compressed, smooth. Uses: Deer browse buckbrush, and its fruits and seeds are a food source for pheasants, quail, prairie chickens, and songbirds. Comments: Symphoricarpos, to bear together and fruit, alluding to the clustered berries. 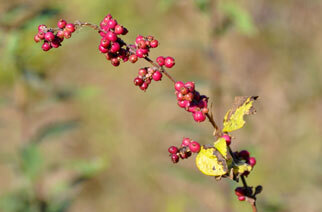 Coralberry increases in abundance in the understories of disturbed woodlands and forests. The fruits often persist on the twigs through winter.